You can specify that an administrative copy of eService Notification emails go to an additional person. That additional person could be an administrator, the attorney's legal assistant, or even a generic firm-wide eService email address. There are two ways that this can be done. Firm eFiling Administrators can set up an attorney as a Firm Service Contact and simultaneously assign a recipient of an Administrative Copy of all eService contacts for that attorney. Ensure that you select the Admin tab (A) located on the top navigation menu. Click on the Service Contacts tab (B) on the sub menu. Select the Firm user (usually only attorneys) for whom you want to assign an administrator copy recipient (C). 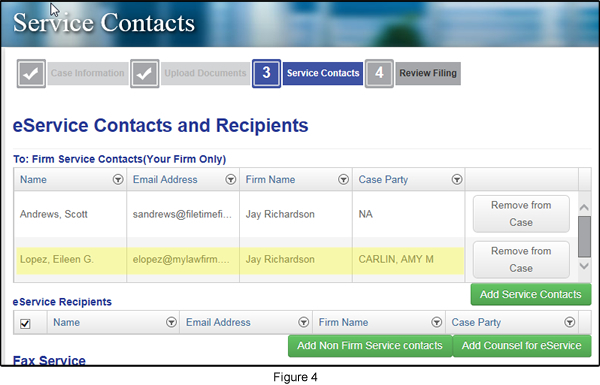 Once highlighted, the Contact Details for the Firm User will then open in the right column. In the Administrative Copy area (D), type the email address to which you want an additional copy of eService notification emails sent. This email address can be for an individual or a generic email address such as eservice@[lawfirm].com, for instance. Click the Save Changes button (E). After saving the changes, a copy of any eService’s to the attorney will also be sent to the administrative copy email address. You can only have one email administrative address per firm user. If the necessary attorney is not on the Service Contact selection list on page 3 of the eFiling process (Figure 1), a filer can add the attorney as a firm service contact and assign an Administrative Copy of the notification emails. Click the Add Service Contacts button (Figure 1, A). You are now on the Attach Firm Service Contacts to this case page (Figure 2). By default, you are shown a list of the existing firm service contacts (Figure 2, A). 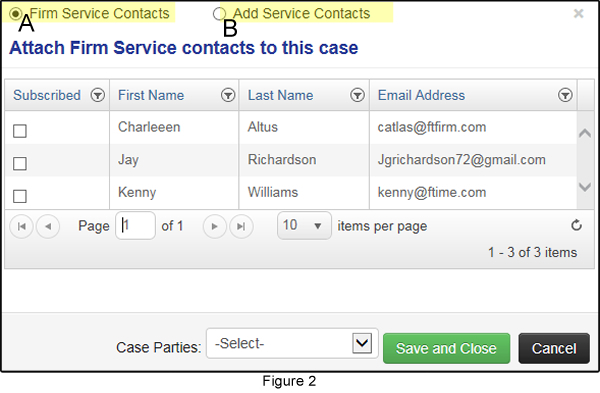 Assuming that the person you do not want to add to the case service list is not shown, click the Add Service Contacts button (Figure 2, B). You are taken to the Add Service Contact page (Figure 3, A). 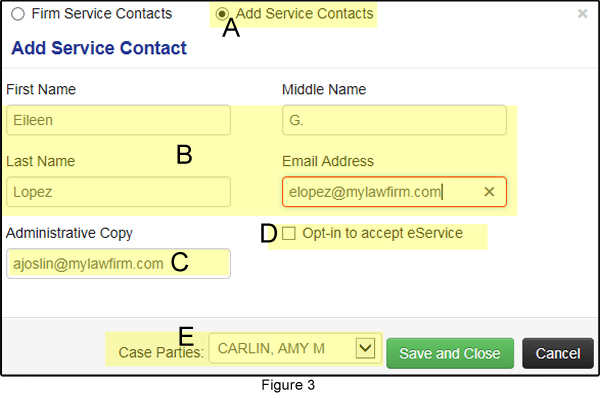 Enter the name and email address of the person in your firm that you are adding as a firm service contact (Figure 3, B). Enter the email address to which you want a copy of all eService Notification emails for this person sent (Figure 3, C). Click to add the person to the eFileTexas Public Service Contact List, if desired (Figure 3, D). Select the Case Party representation for this person in this case (Figure 3, E). 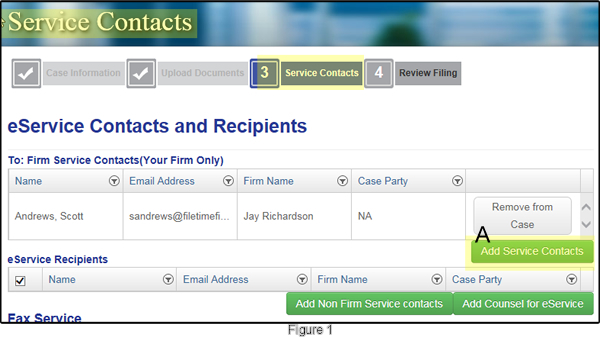 You are returned to the Service Contacts page and the newly added firm Service Contact for this case is displayed (Figure 4).